Pra Luang Poo Thuat from Wat Dee Luang is rather important because the legend of Luang Poo Thuat originated from this temple. 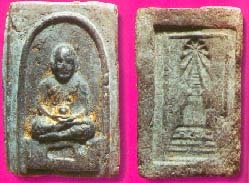 The wahn material used for this batch of amulets were similar to those wahn material used by other temples in creating Luang Poo Thuat amulets during that period. This batch of amulets were chanted on 6th June BE2505 by 108 famous monks. A total of 84, 000 pieces were created and chanted. Most of the amulets were either light brown in colour or black in colour and some pieces are thick brown in colour.